From the author of the New York Times best-selling Politically Incorrect Guideâ„¢ to Global Warming (and Environmentalism) comes Red Hot Lies, an exposé of the hypocrisy, deceit, and outright lies of the global warming alarmists and the compliant media that supports them. Did you know that most scientists are global-warming skeptics? Or that environmental alarmists have knowingly promoted false and exaggerated data on global warming? Or that in the Left's efforts to suppress free speech (and scientific research), they have compared global warming dissent with "treason"? 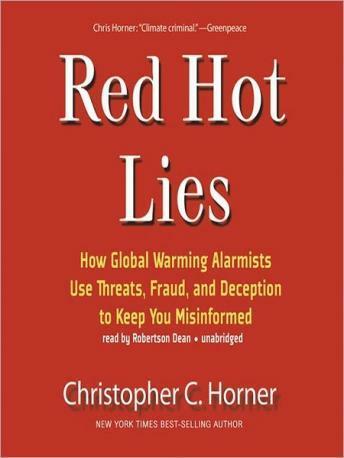 Shocking, frank, and illuminating, Chris Horner's Red Hot Lies explodes as many myths as Al Gore tries to promote. Interesting perspective; certainly will prompt me to re search the facts on the topic, but I do wish the author would have delved deeper into what is to be gained from such a conspiracy. Narrator was good but fairly monochromatic and tiring.